I started using BetterTouchTool back in 2011, and since then it has become one of the top three Mac applications (the other two are Keyboard Maestro and TextExpander) for boosting my productivity and streamlining my workflow. BetterTouchTool is a free application that allows you to use finger gestures with your Magic Mouse, MacBook Trackpad and Magic Trackpad to activate keyboard shortcuts, move and resize windows, launch applications and URLs, select windows, and add functions to applications. I’ve written an overview of BetterTouchTool’s main features and how to get started using it. 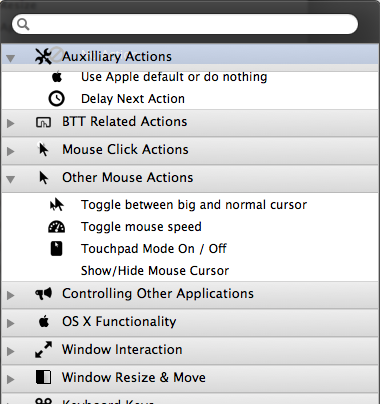 Though BTT can be used by any Mac user, it does require some time to setup and configure gestures that you can remember and are not awkward to use. The following tips will help users who are familiar with the app get more out of some of its more advanced features. 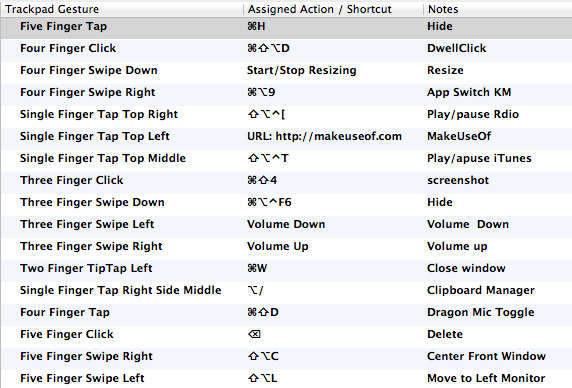 I use dozens of BetterTouchTool actions in my everyday workflow. Some actions are global and most others are specific to individual applications. I use the app along with finger gestures to play and pause iTunes, hide the frontmost application, close Safari tabs, post a tweet in TweetBot, adjust the volume control, delete files on my desktop, and much more. If you’re a current user of the app, you’re probably already familiar with the basic automations, so now let’s explore some more advanced features, actions, and ways to use BTT. If you want to get an idea of what the type of actions you can perform using BTT, just click on the Predefined Actions button on the bottom-right. It includes over a hundred actions that you can apply finger gestures to. Some of the more practical ones include Hide All Windows, Open Application/File, Open URL, Sleep Computer, Mute Sound, Trigger menu bar item and Enter Full Screen. Check out the list and see which actions you manually perform on a regular basis, and instead assign finger gestures to perform those actions using BTT. A later update to the app added way to include additional actions for a single gesture. For example, you probably experience applications that require to you use the Command+Delete keys to delete a file. And typically you also have to confirm the deletion by activating the Delete key before the action is fully complete. With BTT you can perform two or more actions with a single gesture. Here’s an example of how to use this feature with an application called NoteSuite. To create the action, I started off with a Two Finger TipTap Left gesture that activates the Command+Delete keyboard shortcut. I then clicked on the Attach Additional Action button. Next I assigned another action to the same gesture. In this case I added the Return key action. With this setup I perform two keyboard shortcut actions with single finger gesture. This is especially useful for an application like NoteSuite that only allows you to delete one file at a time, and it’s definitely tedious to activate the two keyboard shortcuts each time to delete files. If you click on the Advanced button in the menu bar then click Action Settings, there are whole set of actions for moving and resizing windows, and for dragging and snapping them to different parts of your screen. The developer’s other application, BetterSnapTool, provides even more control for quickly resizing windows. If you prefer to keep all your gesture controls within one application, BTT will suffice. If you find yourself becoming a BTT power user, you might want to take a look at the various settings for adjusting the speed and pressure sensitivity of finger taps. The developer says you shouldn’t have to fiddle with the settings much, but if you find that your gestures are a little slow to activate actions, or if they set things off too quickly, try making some adjustments to those settings. You can always click the Reset ALL button to get back to the default settings. 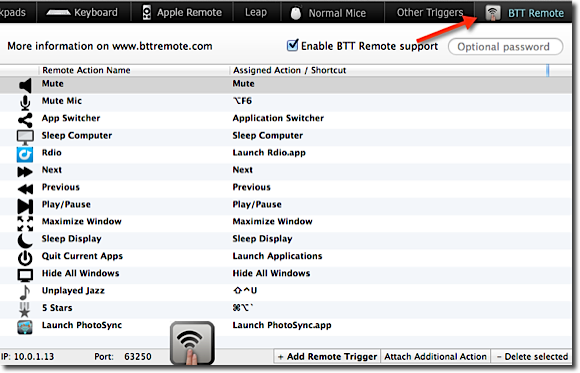 There’s also now BTT Remote ($1.99) app that allows you to perform actions you set up on your Mac using BTT. 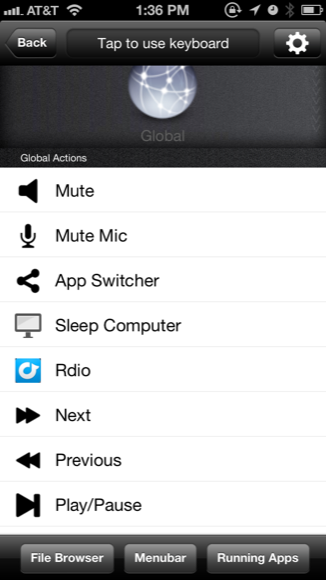 It goes well beyond Apple’s own Remote app in that you can remotely activate virtually any action in your BTT library. I use it for playing and pausing iTunes or Rdio, taking an application full screen, adjusting the sound volume, putting my display to sleep, assigning a 5 star rating to a currently playing song—all from my office recliner. Warning: an app like this can make you pretty lazy. BetterTouchTool is definitely for Mac geeks and power users, but if you work at your Mac throughout the day and you’re not especially good at remembering and using keyboard shortcuts, BTT is an awesome alternative tool for navigating your Mac. How Do You Use BetterTouchTool? I’ve told you how I use this fantastic piece of productivity software, so now it’s your turn – what do you think of these advanced features? How does BTT integrate into your workflow? Let us know what you think in the comments, below.